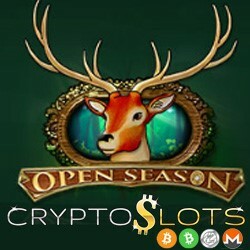 Cryptoslots.com, the cryptocurrency casino, brings you the latest edition to their growing list of slots played only in cryptocurrency, the hunting-themed Open Season. Until Sunday, the cryptocurrency casino is giving you 42% extra on your deposits for extra play time in the new slot. A pack of hunting hounds is a stacked Wild symbol in Open Season and there's a Bonus symbol that triggers up to 15 free spins. During the free spins, the Wild is sticky, holding for the next spin to create more winning combinations. Three or more Scatters pay out an immediate cash bonus up to $1250. "Winning season has begun with this brand-new slot," said CryptoSlots manager Michael Hilary. "Players can claim up to six matches every day, one of our biggest promos yet!" Cryptoslots now has 28 provably fair slots, 9 video poker games and one million-dollar jackpot game. Playing slots and video poker at CryptoSlots automatically earns tickets for the casino's monthly $10,000 Crypto Lotto. "I pay less in transaction fees when I cashout," said one regular player at Cryptoslots, "I get my money really fast, too. So I'm all over this crypto thing!" Available April 2-7, 2019 only. Min. deposit $40. May be claimed up to 3x per day. Wager: 35x. Valid for new Open Season slot only. May be used up to 3X per day. Wager 35X. Valid for all slots except Jackpot Trigger which is played using tokens won playing slots and video poker. In addition to Bitcoins, Bitcoin Cash and Litecoins, you can now deposit and withdraw in Monero (XMR) at Cryptoslots as well.